This is the Romar Beach area of Orange Beach, AL. Farthest East is Phoenix V with Romar House I & II followed by Phoenix III & IV, Phoenix I & II which is all across Perdido Beach Blvd from Live Bait, Adventure Island amusement park and other entertainment venues. 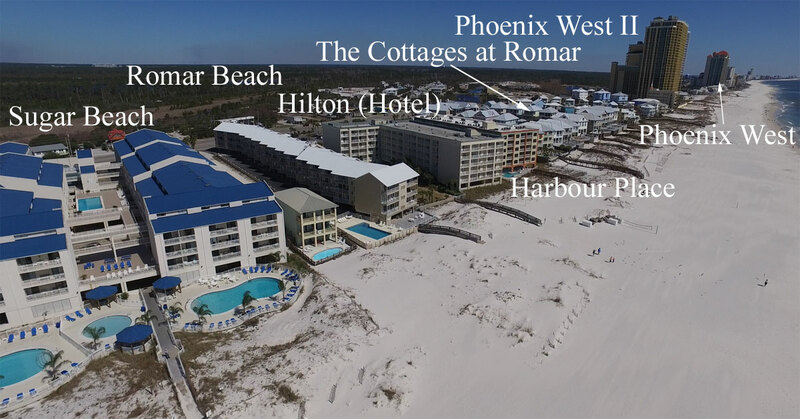 Four Winds, Escapes, Romar Place and Romar Tower all sit just East of the huge Phoenix West condo housing some 300 units on the Gulf of Mexico in Orange Beach. Highway 161 is just outside the visible area to the right (East toward Florida; the state line is approximately 5 miles from Sea Chase) and plenty of shopping, restaurants and entertainment venues are within walking distance. A generous bike path connects Gulf Shores and Perdido Key and the Alabama Gulf Coast is known for great nature trails and opportunities to take in nature while visiting the beaches. The State Parks offer great scenery and the vast majority of this area of the Gulf Coast is wooded - as seen from above. The public beach access near Opal is the Romar Beach area of Orange Beach. Opal is a high-end development with each floor constituting one unit. Summer House I & II is one of the more popular condos in Orange Beach and offers beach-side entertainment and rentals. Bluewater and White Caps sit just East of The Sands; the only rent-restricted condo in the image. Pelican Pointe and Shoalwater are next to the Holiday Inn Express beach-side hotel. The new Phoenix Orange Beach is currently pre-selling and will offer direct gulf front condos in downtown Orange Beach across from shopping and restaurants. Moving West (right on the screen) The Breakers sits next to the Sleep Inn hotel with Emerald Key on the other side. Silver Beach, The Enclave and Sunswept sit next to the three towers of Seachase; one of the most popular Orange Beach condos. Caribe is not pictured and sits on the back waters offering owners and guests deep water access and the closest condo to Perdido Pass and fastest access in Orange Beach along with spectacular views of the Gulf of Mexico. Other pictured condos not on the Gulf of Mexico include the Pass, Porto Del Sol and Mariner Pass - all of which offer deep water access. Perdido Dunes is not on the gulf, but offers a boardwalk to the beach. Gulf front condos are Grand Pointe, Phoenix East I & II, Phoenix VI - VIII and Tidewater. Both Island House Hotel and the Perdido Beach Resort are hotels. The Grand Caribbean sits near the intersection of Hwy 161 and Perdido Beach Blvd and the West-end of Old River; a popular boat launch area. SummerChase is the gulf front condo with a large open area of beach with the pier a pronounced feature. The Four Seasons offers owners and guests access to a great fishing option. Emerald Skye condo is West and the Nautilus to the East; the Nautilus is a high-end gulf front condo with a one-unit-per-floor design. The Admiral's Quarters is farther East followed by The Palms and Turquoise Place; both condos feature two gulf front towers. This area of Orange Beach is narrow and elevated units offer some spectacular views to the North of the various inland waterways. Perdido Pass is located atop the image and offers nearby condos the fastest access to the Gulf of Mexico. On the East side, the Caribe is nearest the pass and on the West, the Pass condos sit at the base of the bridge. The Wind Drift condos offer the best of both worlds with deep water access and also offer gulf front condos in Orange Beach - across the street from each other. The condos from the image that sit on the Gulf of Mexico: Lei Lani Tower, Perdido Quay, Marlin Key and Dolphin Key. Condos on Old River include: Ole River, Dolphin Harbor, Portside, Riverchase and the Yachtsman. All of these gulf front condos in Orange Beach are minutes from numerous activities, restaurants, entertainment venues and area attractions. Listed below is an approximate time frame for reaching the various destinations by car in moderate traffic.